On June 29th, just ahead of Canada’s 150th birthday, ceremonies were held to officially open the Alberta Legislature Rose Garden in Edmonton, Alberta. The ceremony marked the culmination of month of planning and hard work. The garden was both a green industry legacy project to celebrate our country’s sesquicentennial and a lasting gift to all Albertans. 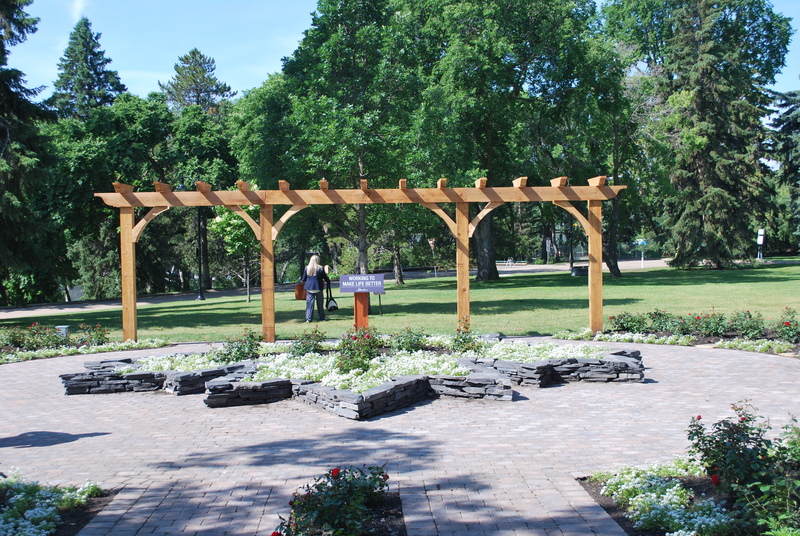 The Canada 150 Rose Garden was an idea put forward by Landscape Alberta to celebrate Canada’s important anniversary while giving back to the people of Alberta. In the fall of 2016, after several concepts were discussed, the proposal for a garden on the Legislature grounds was approved by Alberta’s Speaker of the House. Over the next few months, designs were finalized and construction began. 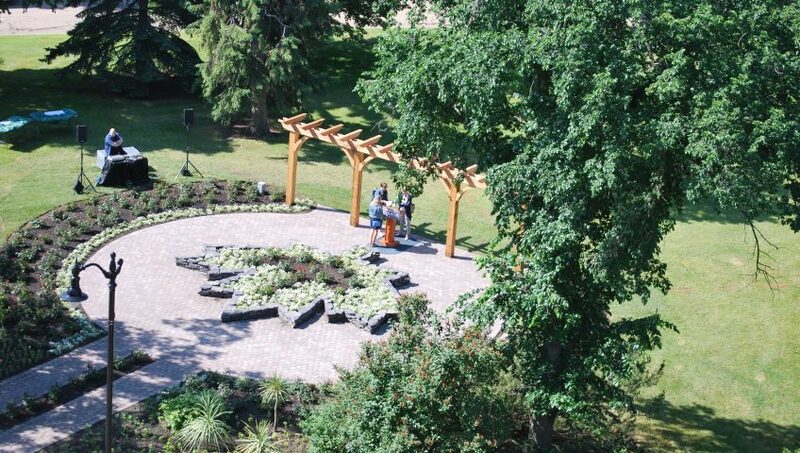 The garden features 150 of the new Canadian Shield Roses, over 1200 square feet of pavers, a cedar pergola that aligns with the vista of the Legislature and frames a natural stone planter in the shape of a maple leaf. This planter holds thirteen of the rose bushes representing all ten provinces and three territories. The Canada 150 Rose Garden was completed in large part by donations and volunteers from the landscape community. Manderley is not only proud to have been directly involved in this project, but also to have stood alongside so many of our clients and other industry members who contributed to this gift to the people of Alberta that they can enjoy for years to come. Premier Rachel Notley was in attendance for the opening ceremonies. “Alberta’s Legislature grounds belong to Albertans and are meant to be used, enjoyed and visited. 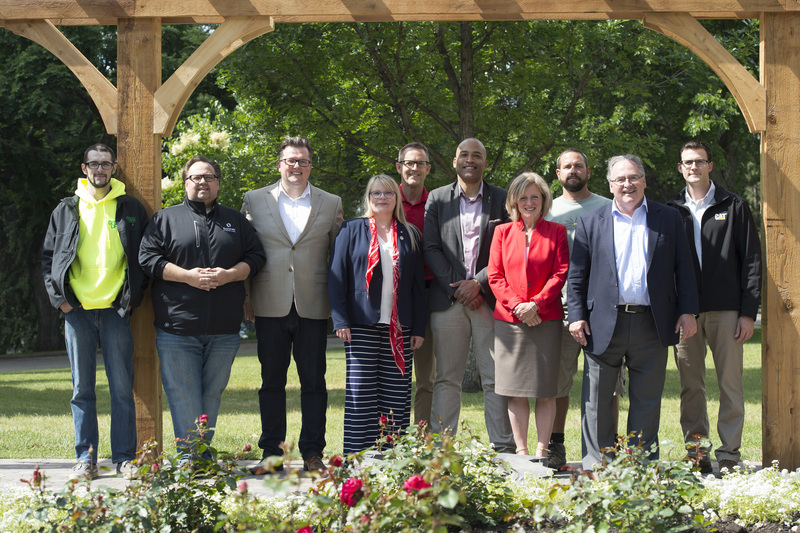 Thank you to the Landscape Alberta volunteers who built the rose garden for their hard work and creativity – This is a one-of-a-kind garden and is the perfect addition to the Alberta Legislature grounds,” Premier of Alberta, Rachel Notley. Participating and helping with the build of the Rose Garden is just one more way the team at Manderley have helped to celebrate Canada’s 150th birthday. 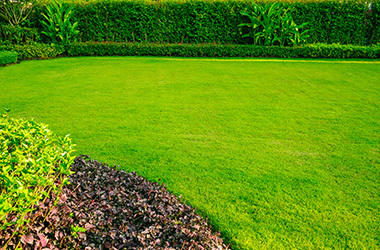 Working with our industry partners in the same spirit of community and fellowship upon which this country was built, reinforces the pride we have as part of the landscape industry across the country. Thanks to Landscape Alberta for the photographs.